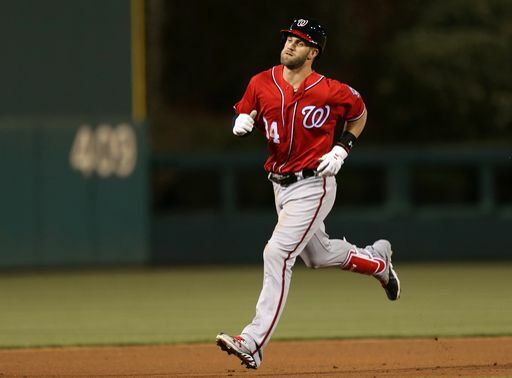 Bryce Harper homered for the third straight game on Saturday evening. Before we had time to live our life and get the post live on our site, he hit another one Sunday. We simply cannot keep up right now. We say it every day. But we won’t complain. We LOVE Bryce Harper home runs. This was career bomb number 102, and it came in a runaway Nationals 8-1 victory in Philadelphia. This came off promising young Phillies starter Aaron Nola. At least, he was promising until he was de-pants’d by this bomb. Who knows what could happen now. This was Bryce Harper’s 10th career home run at Citizen’s Bank Ballpark. This was bomb number five on the season. If they don’t start walking him, he’s going to hit 50+. And spoiler alert, he gets one again on Sunday if you’re one of those read-ahead type folks. We’ll be doing another one of these tomorrow.